Summer may be almost over but sun protection is something we all need all year round. 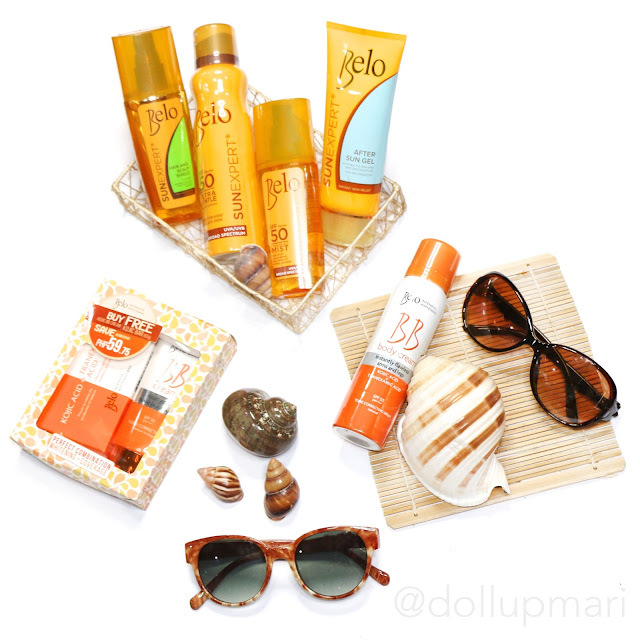 Especially for someone like me as we have a family history of bad sun spots... That's why I'm thankful to Sample Room for sending over all these Belo sun protection goodies! And the Kojic Acid ones, too. 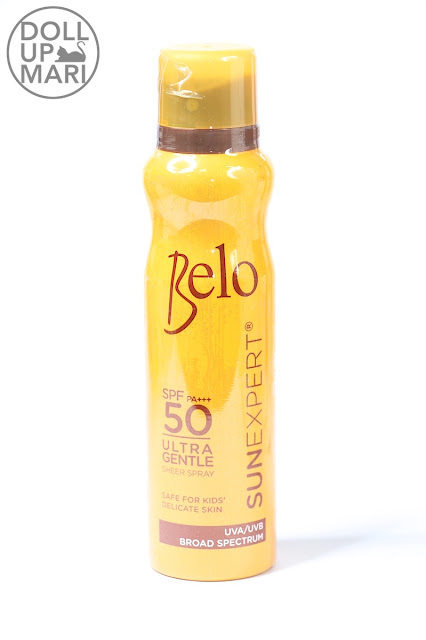 Now is the time to wait for a restock of Belo Sun Expert Ultra Gentle SPF PA+++ 50 Sheer Spray as this is a popular product! This is a very cooling and refreshing sunscreen spray. 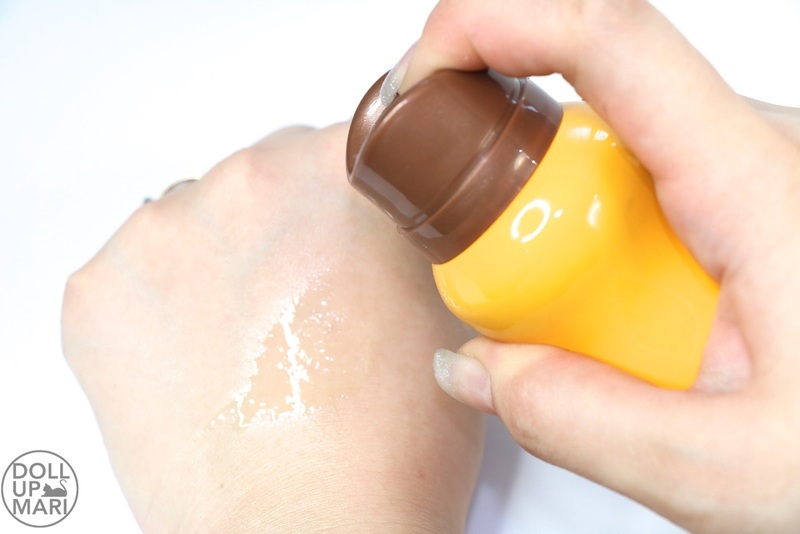 Unlike other sunscreen sprays wherein the same heavy sunscreen is just transmitted in spray form, the formulation of this sunscreen really is lighter. It's really like a mist and it never feels sticky no matter how hot it is. It also gets absorbed very quickly as its formulation really is different. When you see it come out, it's already sheer. It's not like a watered down version of sunscreen lotion. It really is a mist formulation. That's why it gets absorbed very quickly. I love using this because this has a cool feeling when freshly applied, and that is something that is so important given how hot it is. Like we need to protect ourselves from the sun and stuff, but traditional sunscreen lotions are usually so heavy that it makes the weather feel even worse. This is really significantly lighter and it feels less dense on the skin. They now have an after sun gel, too! Be sure to wait for a restock of Belo's After Sun Gel because I think this is a very good thing to have at home especially if you are expecting foreign guests anytime soon. Foreigners sometimes forget that the Philippines is near the equator and therefore is closer to the sun, so the intensity of the sun here is on a whole different level. We once had an Italian-American friend of my sister who came over and was so confident about sunbathing here because it was something she frequently does back in the US. She had probably the worst sunburn of her life and my mom had to scramble and to use all the after sun gels we had, and basically mom almost denuded a whole aloe vera plant to put it on her back. I realized after that that it is so important to have this because plenty a times, foreigners do not realize how harsh our sunlight is here. I also suuuper love Belo Sun Expert SPF PA+++ 50 Transparent Mist and I hope a restock comes soon because it's the opposite of the dense sunscreen we're used to. I dunno if it's just me but applying sunscreen has like a greenhouse effect (?). Am I even making sense (?). Like when you put it on, it feels like there's this heat barrier on you and you feel like you're in a greenhouse. I am not very sure if plenty of you guys have experienced the same things, but more or less that's how I can best describe how I feel. I like that this transparent mist is really lightweight, cool on the skin, and has no greenhouse effect on the wearer. Personally, I find this to be more practical than the aerosol one because I don't have to worry about this so much when traveling by plane. And finally I never knew that my wish has actually come true!!! 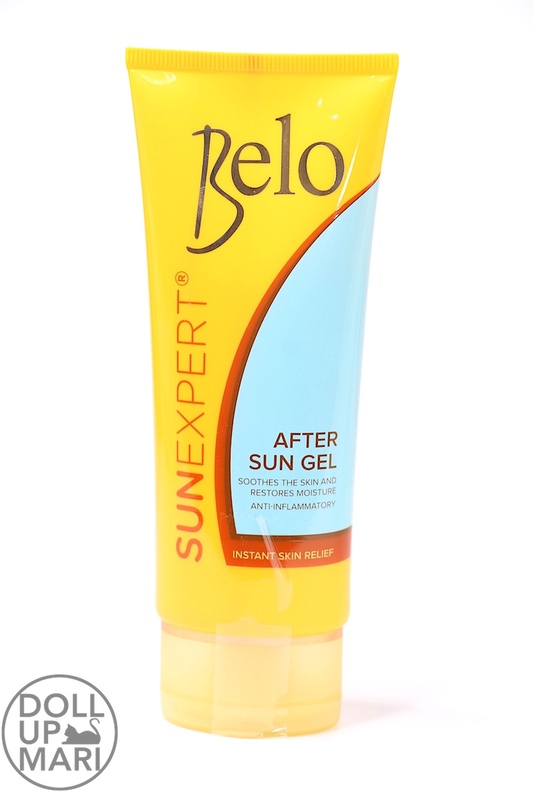 PLZZZ restock Belo Sun Expert Hair and Scalp Shield!!! I actually tweeted once about how much I wished there were a sunscreen for the hair. Like something preventive, because more or less conditioners are more on reactive than proactive. You use the conditioners to undo or repair the damage that the sun has already done. But this is a product you can use to prevent damage from occurring in the first place. And I've already experienced sunburn on my scalp and the result was several days of dandruff-like flakes falling off of my head, so this product speaks to me. My jaw dropped when I opened the package and discovered this because I really feel that this is a big, big gap in the beauty industry. Everybody's killing everybody trying to come up with more potent conditioners but no one has ever tried to explore something that will not make damage happen altogether. I especially find this to be a relevant product because the rays of the sun are just so strong here in the Philippines that this is bound to be useful all year round. Personally, I feel that the sun is what makes my hair the most unmanageable, because I would go to school with good hair and come home with dry and frizzy hair. And I know that the constant is sunlight because my hair is always fried when I go home regardless of whether it's windy or not. And I would like to believe that UP has a controlled level of pollution because of the sheer number of trees. It's really mainly the sun making my hair problematic at the end of the day. That's why I'm suuuper happy about this. 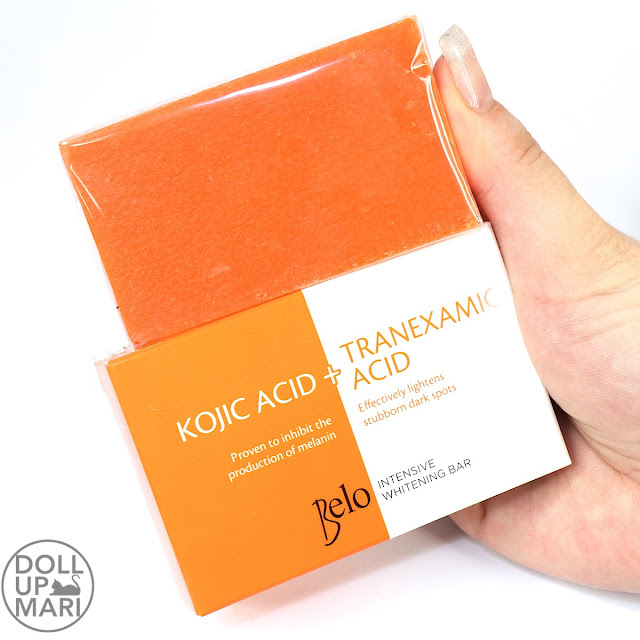 Last but not the least, I also received a Belo Kojic Acid+Tranexamic Acid Combo Pack featuring a bar soap and a BB Cream. This is bound to be on the sheer side if you're used to very thick BB creams... Belo, I think, is more about making lightweight products suited for the weather. I think the company's overall strategy is sort of to that direction, given that they also come up with very lightweight sunscreen sprays and the like. This is a lot like their tinted sunscreen, with a little more coverage. And this is their bar soap! I have never used Kojic Soap my whole life and I actually have no idea why Kojic Soaps are all the rage. I mean like the Philippines is always obsessed with whitening, but as for Kojic Acid, I really don't know. Is it fast? Is it potent? I really don't know. And I'm not sure if I'll know because I'm paler than the lightest shades of almost all foundation offerings in the Philippines. Plenty of my foundations came from trips abroad or from the internet because I'm that ghostly. 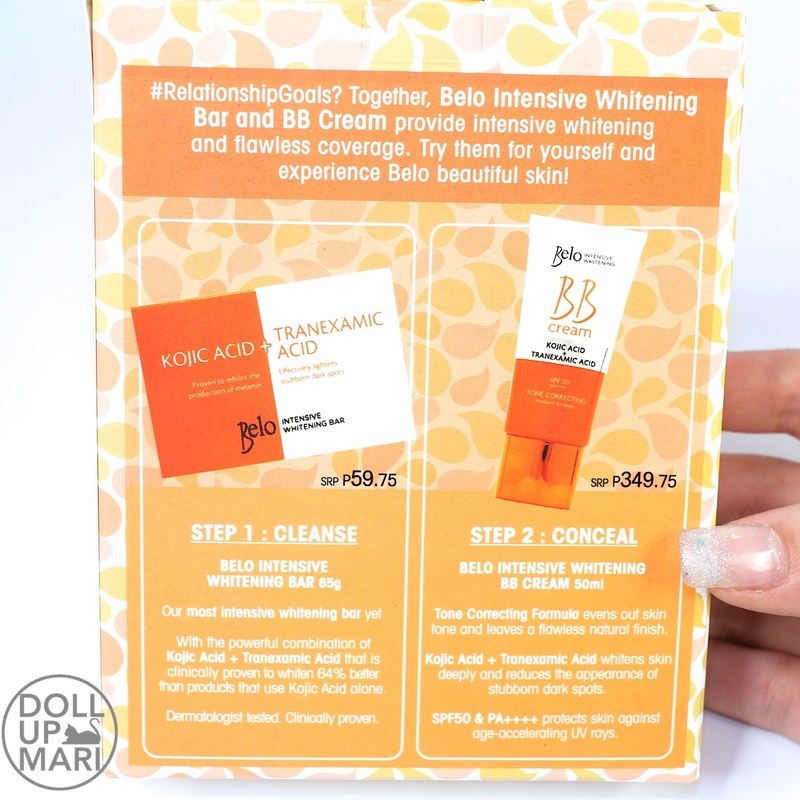 So yaaay, be sure to get your share of Belo products from Sample Room! Belo is such a trusted name in beauty industry. Great thing that have a wide range of Sun protection products. Among those I have only tried the soap which is really good in whitening my uneven skin tone on my arms. And now I will get to try their sheer spray because will be having our family outing this coming week. It's great that it is also safe foe kids I don't have to buy a seperate sunscreen foe my 9 y.o. daughter.